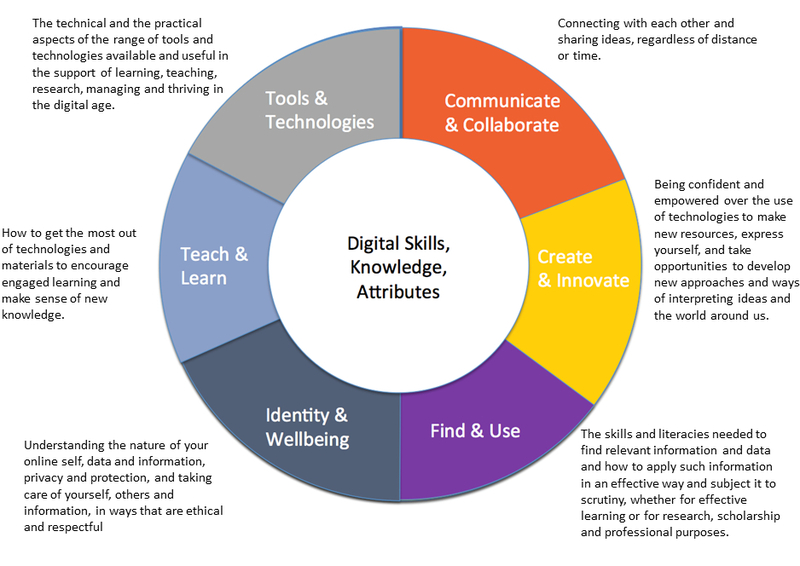 HelenB's e-learning blog: What is 'Digital Wellbeing'? This is the first of a few posts on digital wellbeing. The term is one I coined - or at least brought into the education space - while I was working on a new Digital Capabillities framework for UK HE and FE (funded by Jisc) in 2015. Here, from the framework, is my definition. It was challenging to insert wellbeing into a framework of individual capabilities, especially as I don't think being well is only or mainly an individual responsibility. The design of learning systems, the contents of digital curricula, the distribution of digital know-how, the business models of digital development, the globalisation of digital labour... these are issues with profound impact on our capacity to thrive, over which no individual has control. But I think it's useful, and potentially radical, to suggest that digital capability includes self-care, and that self-care requires a critical awareness of how digital technologies act on us and sometimes against us, as well as allowing us to pursue our personal and collective aspirations in new ways. In using the terms 'capbility' and 'wellbeing' in a digital space I am consciously drawing on Martha Nussbaum's work on human development. Too rich to summarise here, her ideas are opened out nicely from an online review of her 2011 book Creating Capabilities: the human development approach. 1. I presented keynotes on digital wellbeing at the UCISA Spotlight on Digital Capability event and at EdTech15 in Galway, and at a range of events since then (see my slideshare account). 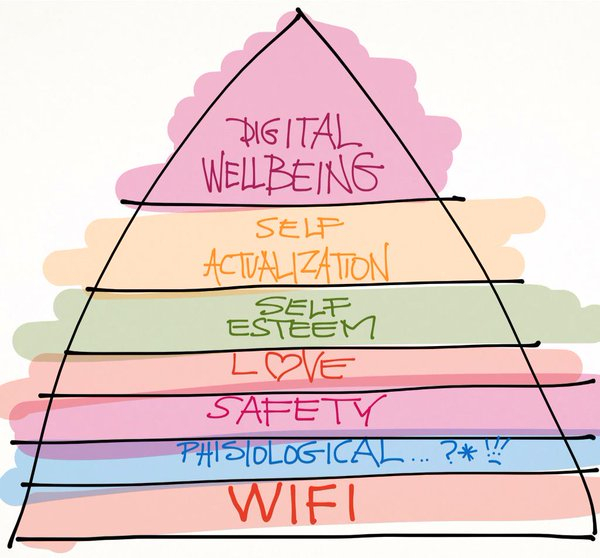 An #LTHEchat about the subject resulted in this re-drawing of Maslow's hierarchy of needs by Simon Rae (thank you Simon). 2. 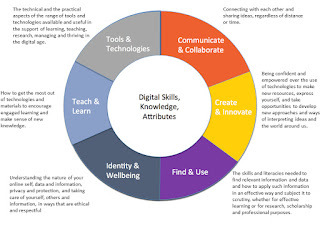 'Digital identity and wellbeing' was included prominently in the Irish National Forum's new (2015) framework of digital skills for HE, after conversations between myself and Jim Devine. You can see the final frameworks on pp. 35 and 36 of this report. 3. 'Digital wellbeing' is a theme for the 2016 Designs on e-Learning conference in New York City, with the call for papers using a definition that closely follows mine in the Jisc framework. I like the connection between 'design' and wellbeing, because the two have often been antithetical in accounts of how people learn. 'Learning design' has tended to treat learners as rational users of a rational system or - worse - as components of the system to be known through measurement and tracking. Here they are treated as embodied, socially-connected and potentially vulnerable human beings, whose learning involves investment and risk as well as cognitive effort. 4. I was invited to talk about the framework with universities across Australia, which has led to the formation of a community of practice in digital capability development. Digital wellbeing was the area that elicited the most interest and excitement over there. The term 'wellbeing' resonates immediately with professional staff - librarians, careers advisers, learning skills professionals and other student-facing specialists - who support learners in ways that are not directly concerned with their subject knowledge or assessments. But teaching in its traditional sense also involves care: acknowledgement of everything learners bring to the experience of learning, including their motivations, challenges, and prior experiences, and an interest in their specific paths of development. 6. I've also been approached by health education bodies to consider developing a common framework. The wellbeing aspect of the Jisc framework is particularly appealing to this sector. 7. I've been approached to work collaboratively with specialists in e-safety and cyberbullying, who feel that 'digital wellbeing' is a particularly helpful term to use in post-compulsory education. Adult learners may not see themselves as needing support to be 'safe' or 'respectful' online, despite the fact that cyberbullying is an increasing problem in universities. But they are interested in how to live, learn and work effectively in digital spaces - for example to understand different norms and cultures of online expression. They also have legitimate concerns about how living, learning and working relationships play out differently in those spaces. One of the joys of working and publishing openly in a digital community is to watch ideas taken up in diverse ways, taking on their own lives and meaning different things to different people. As I've argued elsewhere, terms such as 'digital wellbeing', 'digital literacy' or 'digital capability', are useful only if they allow new conversations to happen, and ultimately if they usher in new forms of practice or critique. They belong to whoever can make use of them, and once they are no longer useful they fall away (though if they have had any traction, they leave changes behind them). Thanks for bearing with me. 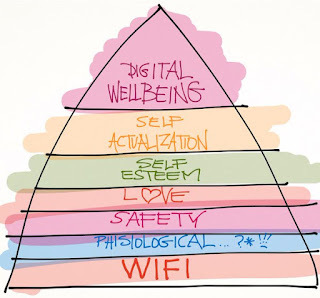 In further posts I'll look at different aspects of digital wellbeing, depending on interest. Great summary, Helen and as you pointed out the idea has been enthusiastically embraced by those of us involved in Ireland's national project: "All Aboard! Empowering and enabling staff and students to flourish in the digital age." After conversations with you on your work with JISC we felt that the term 'wellbeing' better articulated so many of the concepts and ideas that are (increasingly?) important in how we negotiate the digital world not just in terms of our own selves but the manner in which we interact with each other. Our original draft talked about 'digital citizenship' but wellbeing has so much more power, breadth and depth. Thank you, once again, for inspiring our work. Mind-blown... Really really interesting article! Thanks so much! May borrow and reference various parts in a blog post...! Great post Helen, thank you for sharing. Ekkomedia master in data innovation and web. We are managing web design company, web advancement organization, photography organization, and film creation organization, film altering organization and online networking advertising. Great post. I'm looking to research this area for my MA Creative Ed. and I've just got myself a copy of the Nussbaum book too. Ever seen one of those advertisements stating that you can get a website designed for some ridiculous low sum of money? How much should you pay for a decent web design? Great post , thanks for sharing with us...! Good article, well organized, easy to navigate and provides useful insights. Thank you for sharing. How can I vote for your site/post? Have you polling system for your articles like Leaderpoll ? Will you give a chance to vote this post by adding polling system? Thanks once again for the great tips. Thanks so much for sharing. I got relavant information from your post. Looking for preparation courses for GAMSAT in Perth Australia? All too often we have only a vague sense of our development areas and no clue as to how to address development Areas In work, areas of development.The purpose of the leadership development centre therefore was to provide detailed evidence-based and externally benchmarked information about an individual’s strengths and weaknesses. Very interesting and informative blog and about the Learn programming and I must appreciate your work well done keep it up. Extremely fascinating and instructive blog and about the Learn programming and I should value your function admirably done keep it up. EasyShiksha is the best education blog that keep you so much forward than others. i think this is right way of information to start student career to get the bright future. i really happy for this kind of article and wish to go more level of shares for us. thanks well and keep doing more things. Nice! I have enjoyed reading your post. It is well written. It looks like you spend a large amount of time and effort in writing the blog. I am appreciating your effort. You can visit my site. Nowadays, staying competitive involves more than just having a website - retailers need to maximize their web presence. Responsive web design is the demonstration of building a web suitable to work on every device and each screen measure, paying little respect to how broad or little, compact or desktop. Responsive web design is locked in around giving a characteristic and fulfilling information for everyone. Desktop PC and telephone customers alike all preferred standpoint from responsive destinations. Thanks for your article. Thank you for your post. Hawkscode Uk is the leading IT service provider. Hawkscode Uk provides website design birmingham services. Hawkscode Uk provides web designers uk services. Hi, I would like to recommend you a compant called Anegis. It's one of the best consulting companies in the world. If you want to know more, please visit https://ax-dynamics.com/microsoft-dynamics-365. Hi, I would like to recommend you a SEO company called Fox Strategy - pozycjonowanie stron wrocław. Nice Post. Telemedicines are really important aspects now a days. Its really helpful. And such posts are informative for us. JBN Creators is dedicated to provide all-in-one eCommerce websites for your store. Here we are ready to provide you optimum support in terms of improving your business and expanding the horizon. We invite you to make use of our optimum resources so as to meet the business goal at the earliest. The topic has been ignored a lot and seriously not many people take care of digital wellbeing. Good to find it. Thanks for your ideas. You can also find the details on Techtiq Solutions, at the Website Development in UK. The main object of the Techtiq Solutions is to provide quality web services and is among the few software development company in UK. Thanks for sharing this .Keep it . I feel really happy to have seen your webpage and look forward to so many more entertaining times reading here. Thanks once more for all the details.Thanks once more for all the details. The Digital Wellbeing Action Line leverages digital technologies to stay healthy (prevention and early detection) or cope with an existing chronic condition. Both physical and mental wellbeing are considered. The solutions generally rely on enabling consumers to be well-informed about their wellbeing and to be able to use digital instrumentation to monitor and improve their quality of life, according to the motto an ounce of prevention is worth at least a pound of cure. Thanks for sharing this information .I have got a lot of knowledge from this .Reachabove media is the affordable website designers that focuses on quality , innovation and speed. It specializes in wordpress, php, shopify, and a wide arrange of coding. We offer hosting to all of our Web Design clients. I'd argue that digital well-being means that you operate at the maximum efficiency with minimal effort. There are applications that allow you to do just that - for instance https://ax-dynamics.com/digital-transformation. Wow that was really a great read indeed. Expecting more such blogs in near future. Thanks for sharing. Great post. Thanks for sharing this amazing post. Thanks for sharing this informative post. Great work. I really enjoyed reading this article. Keep posting useful content. Very nice post. I appreciate you for sharing this wonderful post. Keep posting. If you want your brand to stand out from the crowd, then make sure to promote it with a compelling website. Only a great website can help your audience unlock all the essential information about your business. So, what are you waiting for? Count on the best web design company anywhere at your disposal. Nice post!The information which you have provided is really nice and awesome. I am impressed by your writing style and this informative post. keep sharing valuable knowledge. I got such a good information on this topic, thanks.. keep it up!! We are proud to provide creative work ideas, integrity &fast results compared with any other Website Design Company in Dubai. veri nice article. if you aguys are looking for advertising agencies in bangalore, please connect tempest advertising. Excellent Post about website design or development. We are very glad after read this. If your website is good enough, the visitors will at least get a positive impression about your company and might even become customers. Hence, if you still don’t have a proper website to promote your brand, then get one with the best web development company in your town. Thanks for sharing a very interesting article about What is 'Digital Wellbeing'?. This is very useful information for online blog review readers. Keep it up such a nice posting like this. Thanks for sharing a very nice post. I really enjoyed reading your blog. I really feel happy to see this blog, really helpful to me. We are top rated Healthcare Portal Development Company in India offering out-of-box healthcare portal solutions including website, portal, web application, mobile Apps etc. I've been working in e-learning for nearly 15 years now. It's something I fell into one day and haven't yet found my way out of. This blog is for occasional explorations of the thicket.